Do you need a reliable helping hand that can assist you with professional furniture removals services? We are an agency which executes furniture removals in London. Therefore if you require professional help, don’t hesitate to contact us. We have helped numerous people who needed assistance with their furniture. We are still offering our services in exchange of a reasonable amount of money. 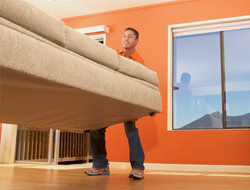 Our agency has a team of skillful movers who are capable of transferring even the heaviest furnitures around your house. If you need your belongings to be transferred somewhere distant, our agency can provide several spacious vehicles at your disposal. Whatever the furniture issue is, we can help you out. Avoid the possible injuries caused by weight lifting and let us do the removals tasks professionally. Our movers have the physical capability to carry in and out heavy furnitures such as sofas, chairs, tables, beds, wardrobes and everything else that needs to find a new place. Hurry up and call us to book a furniture removals services in Londonwith us. We can perform special safety packing, if you want us to. That will raise the level of safety during removals and transportation procedures. By entrusting the furniture removals to our agency, you can be certain that your property won’t receive any damage. Many clients took advantage of our services and none of them had any damage or scratch complaints. Once your furnitures are ready, our movers will transfer them to another room or they will load them in our vehicle for distant transportation. You can trust our agency because it offers the most reliable furniture removals in London. We have an excellent team of movers who are capable of transferring your furniture to any location. They are at your disposal seven days a week. Therefore if you want to book a furniture removals service, call at our office to clear out all the necessary details. Make an appointment and leave the rest to us.